Click on the access points in the map above to view more information and photos on each access point. Click here to download all the segment maps in a PDF file and printer-friendly format. 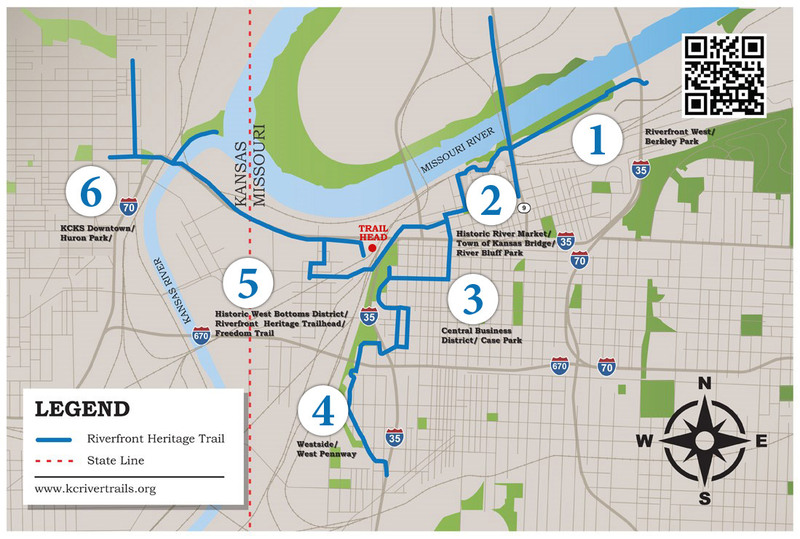 The Riverfront Heritage Trail is a fully accessible 15 mile bike/pedestrian pathway that begins at the riverfront and winds through the oldest and most historic parts of bi-state Kansas City. A close examination of the name of the Trail reveals the trails overall objectives, namely a trail system that provide access to the river and reawakens our appreciation of our area’s unique history. It links communities, parks, and exciting destinations with unique new venues and dramatic public artwork. The completed trail system was never intended to be an area wide trail system. Rather it was designed to be the hub of such a system. By conquering numerous topological challenges (steep terrain and rivers) and manmade hurdles (levees, highways, bridges and railroads) it should ease the burden on subsequent trail efforts. The most immediate goal is to help make future trail construction easier and less costly. The trail’s most ideal goal will the time when this effort will be consumed by a metropolitan trail system. Meantime, the Trail hopes to improve the quality of life in our community by reawaking an interest in our region’s history, providing access to our spectacular rivers, enhancing area transportation, all the while gracing the trail with exciting public art and comfortable greenspaces. Click here to go on a photo tour of the trail! The Riverfront Heritage Trail is completed. It is a product of a coalition of public and private stakeholders including Kansas City, Missouri; The Unified Government of Wyandotte County and Kansas City; and the Port Authority of Kansas City. It soon became obvious that these three separate municipal agencies were limited by their own charters. We needed a separate entity that would facilitate discussion between these partners relative to planning and the determination of compatible goals. This gave rise to the not for profit Kansas City River Trails, Inc. whose board is composed of representatives of all those who have been working on the Trail. These partners were committed to developing a high quality Trail while simultaneously improving and beautifying the adjacent urban landscape. Where possible every effort was made to improve infrastructure, replace barren land, and clean up and remove blight. Thus, in the final analysis, the trail is more than just a recreational asset. Indeed, it is a serious commitment to positively transforming the bi-state landscape and the community’s perception of livability. 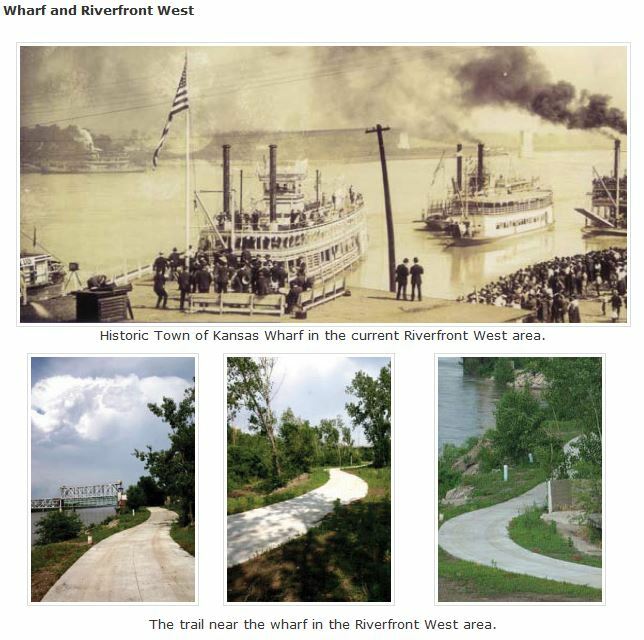 Kansas City River Trails, Inc.
Kansas City River Trails, Inc, (KCRT) is a recognized Missouri Not for profit Corporation that was created to improve project efficiency, establish amenities, run programs, and maintain the Riverfront Heritage Trail. Moreover, it was created to insure continuity of Trail Design promote the Trail in the community. KCRT is not always in a position of authority but it stands ready to assist anyone in their trail construction efforts. We completely endorse all efforts to build a metropolitan trail system. Meantime, KCRT will make every effort to improve and preserve the Riverfront Heritage Trail (RHT). We have seen that the RHT is a catalyst for redevelopment, reimaged access to the river, reclaimed history that had long been overlooked and it has been a required amenity for a highly educated workforce. In addition, it has begun to be used for a safe route to school for schoolchildren. Finally, it has become an increasingly important component in the area’s efforts to establish an energy efficient metropolitan transportation system. 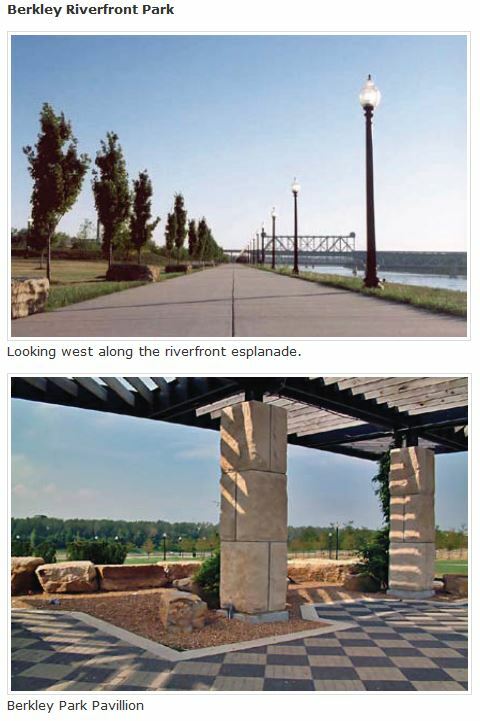 The Riverfront Heritage Trail has won several important design and environmental awards. In 2015 it was recognized as the most outstanding Trail project in the State of Missouri at the Mid America Trails and Greenways Conference. The trail also received a Gold Level Sustainability Award from the Kansas City Industrial Council and the AIA Excellence in Urban Design Award. Finally, the RHT and KCRT received the 2004 Legacy Award by the Missouri Lewis and Clark Bicentennial Commission for the Trail’s commentary efforts. The most significant award was its designation as "The Spirit of Kansas City" Regional Scenic Byway. The overall trail system has been divided into six different trail segments that give more detailed trail segments with more exact addresses and parking instructions. Please know there are no services along the trail. The trail does run adjacent to many businesses and restaurants that would welcome your business. To define each trail segment we labeled it, described the area and parking available. 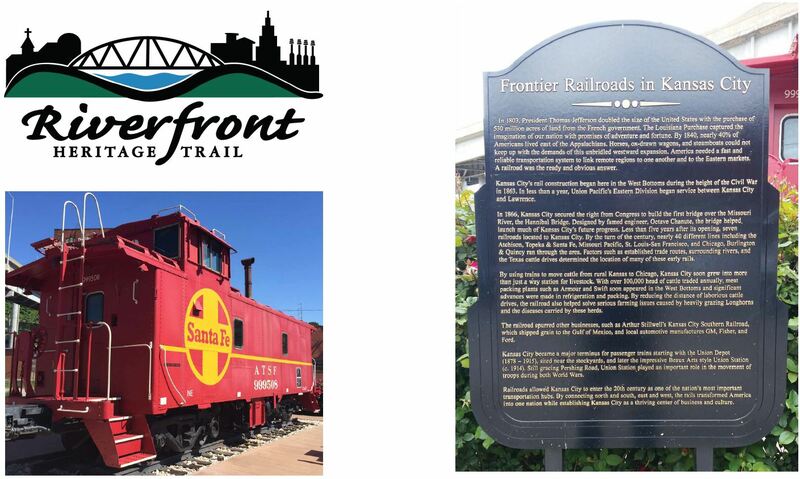 We also provide a copy of some the art and/or historic markers unique to each trail segment. This trail segment runs along the riverfront from the Bond Bridge to the Town of Kansas Bridge. Off-street parking is available in Berkley Park just east of the Heart of America Bridge and west of I-35. It allows you to get very close to the Missouri River particularly when you pass under the ASB Bridge. The Town of Kansas Bridge provides a dramatic panorama of the Missouri river. This part of your trip brings you very close to the site of the Town of Kansas and to some ruminants of steamboat docks. Historical markers describe the town in its earliest days. Really dramatic public art helps the visitor develop an appreciation of the engineering work that had to be mastered in order to cross the river. This trail segment runs between the Town of Kansas Bridge and River Bluff Park. There is a variety of on-street and off-street parking near the trail. The Town of Kansas Bridge allows users of the trail to get over several active railroad tracks and a levee system. The town of Kansas still waits for archeological study. Hopefully, that can be observed from this bridge. Meantime it is a good way to get to and from the trail that is adjacent to the river from the adjacent bluff. Using mostly share the road systems the trail works its way through north edge of the City Market until it reaches Wyandotte Street where it splits and heads south to Downtown and west to the West Bottoms. On the West end of the Bluff visitors on Beardsly Street the Trail runs through River Bluff Park. This exciting little park presents an overview of the great bend of the Missouri, the Wheeler airport, and a section of the first paved street of the Town of Kansas. Also in this park there is a national acclaimed art work depicting the dugout canoes used by the Lewis & Clark Expedition. 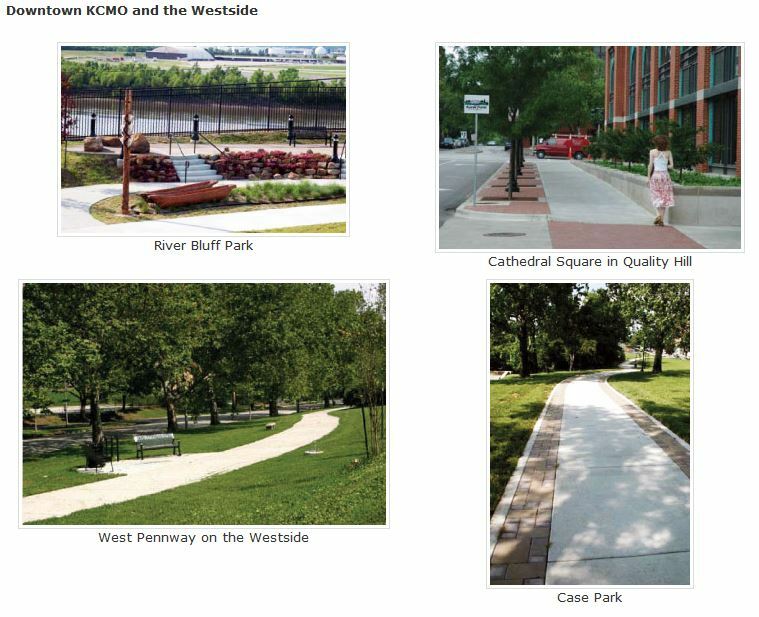 Obviously, most of the street plan of Downtown KCMO was in place when we created the route for the trail there. When possible we took out unnecessary parking to create bike lanes and we increased the width of sidewalks to create safe passage. In spite of these efforts most of the trail through Downtown KCMO had to rely on share the road bike routes. Where possible we placed the trail where it would link parks and important vistas. When we linked Case park we made sure is was totally accessible. Part of the trail takes you to the bluff where Lewis & Clark stopped on their return trip. Weekend parking should not be a problem unless a major event is taking place. This trail segment follows West Pennway, passes over a pedestrian bridge at I-670 and connects on the north with downtown. As it winds through the Westside Neighborhood it features a several attractive art works that feature shapes and colors that are associated with the Mayan Culture. Even the trail lighting is designed to reflect the Spanish-American background of many of the residents. 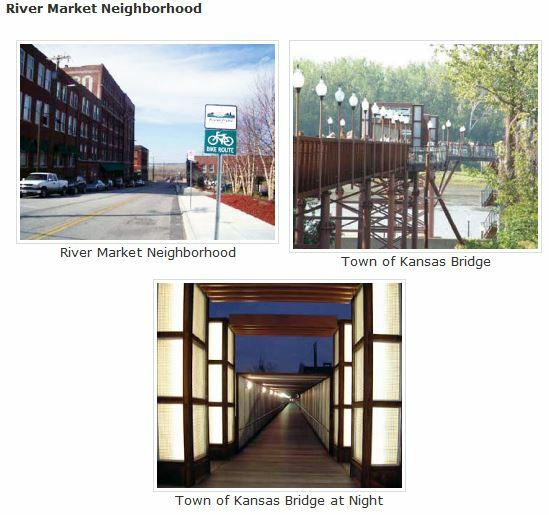 On the north end of this trail segment you will discover a decorative pedestrian bridge that gives you an excellent view of Kaw Valley as it connects the oldest parks in Kansas City. 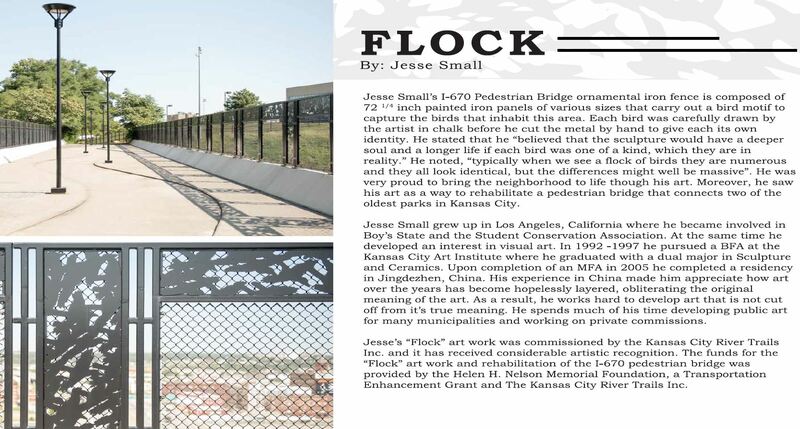 The bridge itself features spectacular iron work that depicts the frequent flock of birds seen in the area. 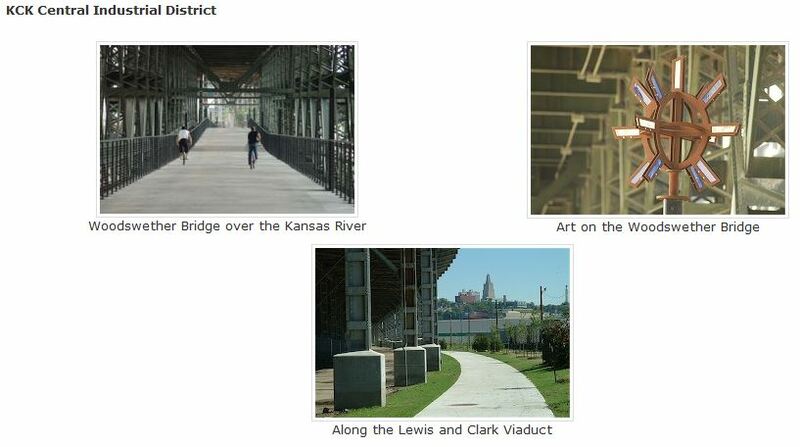 The West Bottoms trail segment begins at the top of the bluff near the Lewis & Clark memorial and reaches base via the Bruce Forrester Viaduct. This route allows the Trail user to reach the bottom without having to wait for trains which frequent this area. At the base of the viaduct the Trail doubles back to Mulberry Street where it heads north in the direction of the Lewis & Clark Viaduct. The trail splits here. If you follow the Trail east you will find Riverfront Heritage Trailhead. 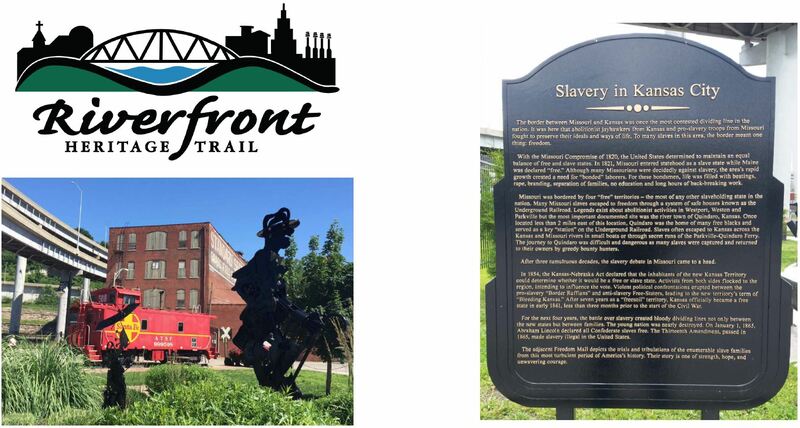 The trail head includes ample off the street parking, The Trailhead contains two memorials to critical events in the history of the City that took place on that site, namely, the route escaping slaves took to reach the Free State of Kansas and first tracks of a frontier railroad that that would eventually place Kansas City in the center of commerce. The trail west has been named Freedom Trail because it was such a critical route for slaves trying to find safety in the Free State of Kansas. 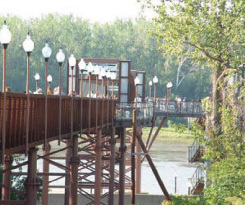 The West Bottom segment of the Riverfront Heritage Trail is connected to the Kansas Trail by the Woodswether Bike/Pedestrian Bridge. The bridge is exciting in and of itself because of the beautiful river vistas and the art work that adorns the bridge. Area artists have used their talents to share how they visualize the bridge, Topics range from the Indians who lived there, the slavery exodus, to the river itself. 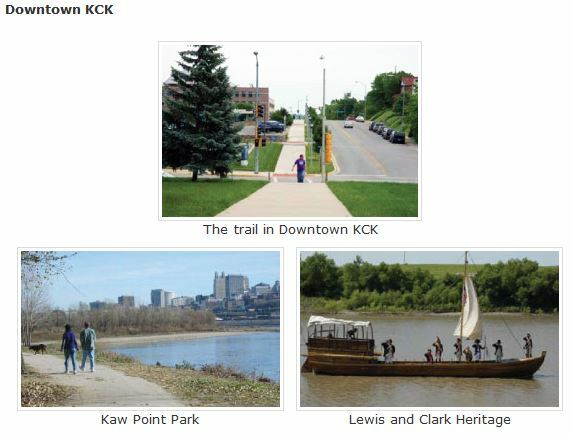 The Kansas Trail has 3 different origins, namely the Huron Cemetery, a link to Jersey Creek Trail, and ,most importantly, a route to Lewis & Clark Kaw Point Park. The latter park has excellent off the street parking. This park that lies at the confluence of the Kansas and Missouri Rivers is a recognized stopping point of the Lewis & Clark Expedition. This park allows closest contact with the river as it permits walking on the banks of the river, has a boat ramp, and is the site most often chosen by photographers when taking pictures of the river. Kansas City River Trails Inc. is a Missouri 501c3 not for profit. It has been in existence since 2002. 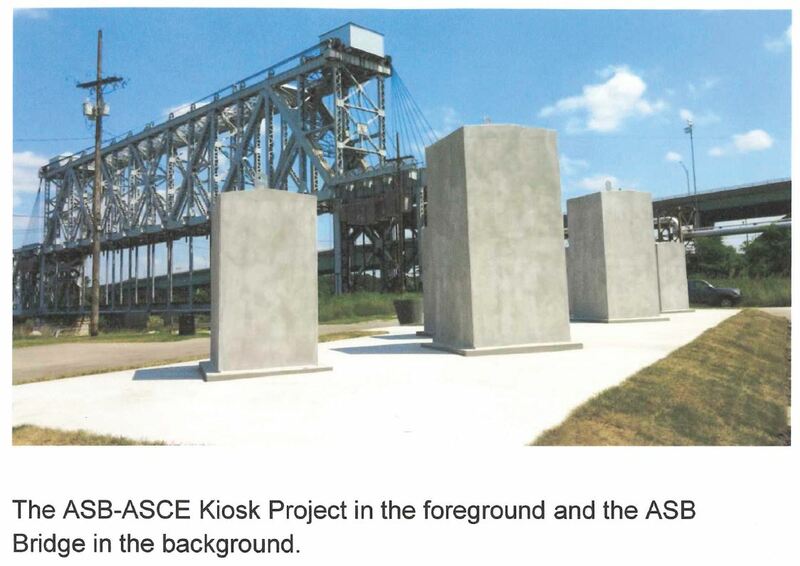 Its primary goal is the construction and operation of the Riverfront Heritage Trail. It is a volunteer organization. As such we pay no salaries. Any contribution will go directly into trail development. The management of the affairs of the organization is done by two Co-Chairs (One from Kansas, one from Missouri) and a President and CEO. These individuals are elected from a 30 person Board of Directors. Our Treasurer is a CPA. KCRT is a fiscally sound organization. We manage two separate and independent accounts. We have about 25K dollars in the Kansas City Community Foundation as an escrow account to repair any damage to our art work. In addition, we have 45K dollars in a general fund for incidental expenses, insurance, and marketing. You can donate a tax deductible amount to either account. We would like to introduce improvements to the trail such as historic markers, trail amenities and art. This will take more funds. Cycling and walking on the trail is one of the healthiest and most environmentally friendly ways to get from Point A to Point B. While it may be tempting to hang up your bicycle and not walk on the trail when the snow starts to fall, it’s actually possible to use the trail and ride year-round with a little planning. Here are some safety tips to consider. Don’t layer—a common misconception is if you wear a lot of layers, you’ll stay dry. Unfortunately, what usually happens is you’ll just be wearing three wet shirts instead of one. You should dress for the temperature outside and wear a very thin poncho if none of your gear is water resistant. Avoid brick and metal—these surfaces become very slick when wet. If you must travel over brick or metal, be sure to do so with extreme caution. Lighten up—you should always have reflective gear in the rain, as visibility will be much lower for other trail users, motorists and cyclists. You can attach additional reflectors to your bicycle or use reflective tape on your clothing. It is a false assumption to think the trails have been cleared of snow. Slow down—it’s usually twice as hard to brake when it’s snowing out. Give yourself double the space when approaching stop signs and intersections to ensure you don’t skid in the snow. If biking consider use an old mountain bicycle—while fat bikes are great, they often cost $3,000. If you have an old mountain bike gathering dust in your garage, consider using it when it’s snowing. You’ll utilize and otherwise-wasted bicycle and save yourself a big hunk of change as well. Leave your bike in the garage—if you bring a warm bike outside in cold conditions, you’re more likely to get ice buildup in your brakes. Leaving your bicycle in the garage is often much better for its longevity. Get acclimated—if you usually take a 10-mile loop but the temperature jumps to the mid 90s, it’s unreasonable to expect you can travel as far in such poor conditions. Take it easy and let your body get used to cycling in the heat and humidity. It is also unreasonable to expect there will be ample places along the trail for water. Stay hydrated—a 150-pound walker or rider should drink at least one 16-ounce bottle of water per hour on a ride, but larger riders on hilly routes could need up to four bottles per hour. Heat exhaustion sets in quickly, so you should always be prepared with plenty of water. Leave early (sometimes)—if you’re not a fan of hot temperatures, consider leaving early in the morning, particularly before the sun rises. The sun is at its highest at noon, but temperatures continue to rise until 3 PM. Be wary of this tactic if you’re not a fan of humidity though—the morning is often the most humid point of the day. This article was provided by www.personalinjury-law.com, an organization dedicated to providing the public with information about personal injury and safety information. Nothing in this article should be construed as legal advice, and it is intended for informational use only. Be sure to review your local cycling ordinances to ensure you ride safe and legally. Your help is needed to maintain the quality of our trails. Click on the Donate button above to help! Faultless Starch/ Bon Ami Co.
Faultless Starch / Bon Ami Co.